Frictional Games is putting a lot more thought into how to scare you stupid with its next in-house project. 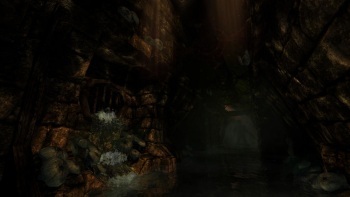 Most people who played Amnesia: The Dark Descent will likely agree that it is both one of the best and one of the worst games they've ever played, and for the same reason: it was scary as hell. Not everyone reacted to it with the same enthusiasm, but as videogame horror experiences go, there are very few that can compare to Amnesia. And yet according to Frictional Games co-founder Thomas Grip, the studio took a bit of a willy-nilly approach to building the terror. "The way we handled horror in Amnesia was that we just threw stuff in without thinking too much about why it was there," he said in an interview with Beefjack. "Our main goal was simply to build up a scary atmosphere, and whatever contributed to that was added." The good news, or bad news depending on how you look at it, is that the studio is putting a lot more effort into tying things together in its next game. That's not Amnesia: A Machine For Pigs, the sequel being developed by thechineseroom, but a new project Frictional is handling itself. "For our next game we want to have more thought behind everything that happens, and tie things together, so if the player thinks some more about it, it will take things a step further. So we want these extra layers to the gameplay that will really get below the skin of the player," he explained. "The small stuff we had in Amnesia felt like a good indicator that this could have excellent results, so it felt like the logical next step to take." Oddly enough, during all the time I spent playing Amnesia I don't recall ever thinking that what it really needed was to be just a little bit scarier. I did enjoy uncovering bits and pieces of the backstory as I scuttled through Alexander's manse, however, and a deeper payoff for exploration would definitely be welcome. But more exploration means more exposure to the game's unpleasant elements - which is to say, more opportunities to have your pants scared off - so it's a bit of a double-edged blade. Which I suppose is the point. Frictional's new game doesn't yet have a name, but is currently expected to be ready to drive you to the verge of tears sometime in 2014.